Necklaces, keyrings, dolls, Lego and... wine charms?! Would that work, do you think? Let's face it - over the years, Mario has been pretty well merchandised. Chances are if you can buy it, you can buy it with Mario's grinning face on it. Even so, there's a booming trade developing of unique, hand-crafted Nintendo items available online that span all kinds of items you'd never imagined. 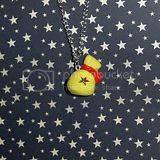 A lot of them are on the popular crafter website etsy.com, but there are dozens of others around the 'net, so we thought we'd give you a quick round-up of some of our favourites. Picture the scene - you've got your friends around for some multiplayer Wii action, and everyone's developing a bit of a thirst. Being the debonair sort of Nintendo fan, you bring out a fine Chilean Merlot, but then realise all your tall Bordeaux glasses look the same. How are you going to distinguish them? Well, with a NES cartridge of course! Yes - simply put one of these around the stem of each glass and nobody will want to let go of their drinks all night long, although whether you'll get all the charms back at the end of the night is anyone's guess. Okay, so Samus Aran in her suit might not be everybody's idea of a cuddle, but that doesn't mean she doesn't deserve to show her softer side every now and again. Her very soft, woollen side, thanks to these awesome knitted dolls by talented etsy.com member deadcraft, who also created some amazing Zelda dolls, though sadly it looks as though both sets have sold out. 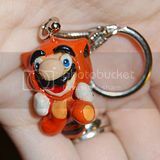 Tanooki Suit Mario keychain courtesy of CrystalynBryan of etsy.com. We all love Tanooki Suit Mario like we love our pets or significant others. It's just a shame we have to leave him helplessly trapped inside our cartridges and consoles once we tear ourselves away to attend to the mundane bits of our lives. Wouldn't it be great if we could take the little furry fella with us on our day-to-day business? Well, now you can with this fantastic clay keychain! The slightly crazed look on his face makes it all the better. I'm tempted to leave it there, but that wouldn't do justice to this awesome rendition of the game's famous first level reproduced entirely with Lego blocks and characters. Seeing Donkey Kong's huge barrel head perched atop his tiny neck certainly makes the original Mario villain a much scarier sight. Animal Crossing Bell bag necklace, courtesy of YellerCrakka on etsy.com. It's surprising not to find more Animal Crossing-themed crafts on the 'net, considering how damned cute it all is. They'd have to go some way to beat this super-cool Bell bag necklace though, which is just screaming out to be bought for the important woman in your life who doesn't quite understand video games. It's so sweet that nobody need know its origins as a tool of manipulation in the hands of that awful raccoon. 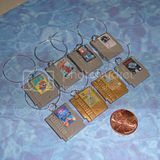 Of course there's thousands of Nintendo-related items out there so we can't feature them all, but be sure to check out some of the most popular sites - Etsy, SpriteStitch and Nintendo Papercraft. 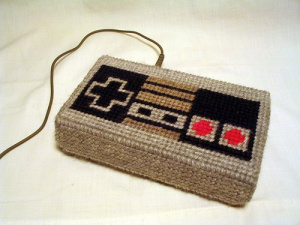 If you find - or even better, make - any awesome Nintendo items, please share them with us! You forgot Meat Boy plushie. I snuggle up to him every night. Is your meatboy plushie made out of real Meat. Nope, he's made of tofu. That tanooki keychain looks pretty scary! _ Samus is kind of cute as a knitted doll. The lego is all kinds of awesome. The Donkey Kong lego set is awesome!